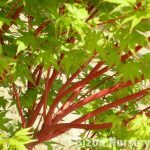 What should I do about a newly planted Japanese Maple that experienced 1 night of 32 degree temperatures. The leaves at the top of the tree are limp, but not all the leaves seem to be effected. Just give the tree time to recover! You may lose a few leaves, but it should recover over time. They can, usually, survive this. It may make the leaves droop, or shrivel in response, but the tree will continue to thrive, even if it drops some of those leaves.